This is a short study I conducted on the typical aging curve for PGA Tour golfers. 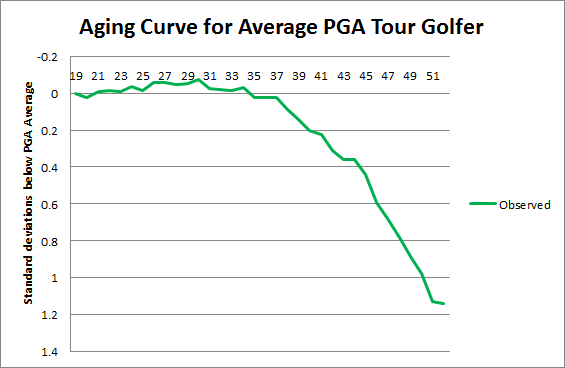 I stress again, this is the typical aging curve for the average PGA Tour member. As I discuss below, it is not likely to reflect the aging curves of the most elite golfers. All PGA Tour golfers who in Year 1 played in >20 PGA Tour  rounds and who in Year 2 played at least 1 round of golf worldwide. I studied 2009-2010, 2010-2011, 2011-2012, and 2012-2013. My sample included 916 pairs of seasons. I then compared these golfers in all worldwide rounds in Year 1 and in Year 2. I regressed each Year 1 and Year 2 to PGA Tour Average (0.00) using the equation Y=(.6944*X)+0.01. I regressed because I want the best estimate of a golfer’s “true talent”. Golf performance is heavily influenced by luck; over a normal 85 round season, a golfer’s displayed performance represents approximately 70% skill and 30% luck. The delta of Year 2 – Year 1 provided my comparison point. I did not weight my data. I included only golfers who appeared in >20 PGA Tour rounds in Year 1 because it is rare for a golfer to accumulate >20 PGA Tour rounds and subsequently fail to record a single round worldwide because of the nature of the international golf tour structure. Golfers who fail to re-qualify for the PGA Tour almost always are able to play on the Web.com Tour the following season. If I had used all golfers with >20 rounds in Year 1, many golfers who performed poorly on the Web.com Tour would’ve fallen completely out of my sample because they would have played on minor tours for which I do not gather data. By measuring only PGA Tour players I ensure that no matter how lucky or unlucky, good or bad a player was in Year 1, it’s very likely they will be included in the data for Year 2. The aging curve for this sample is basically flat from the age 21 to age 34, with a significant year-by-year decline beginning in the late 30s. This indicates that the golfers in this sample did not generally improve or decline due to age until the mid-30s. The sample is small until age 26, but it’s possible to observe a slight improvement of -0.01/season. From age 26-36 the decline is less than 0.01/season. From 37-47 the decline accelerates to 0.06/season. After 47, the sample is relatively small, but shows continued significant decline. Obviously this is surprising, as I anticipated finding a normal aging curve where an athlete reaches peak performance in the late 20s before declining beginning in the mid-30s. Instead, the sample hardly improved through the late 20s and even slightly declined by the mid-30s. After that, the sample followed the sharp decline in the late 30s and 40s which is anticipated from other athletics-focused aging studies. My main hypothesis about why golfers show no age related improvement relates to the sample I chose to work with. This study measures the typical PGA Tour professional. Most of the public is familiar with golfers who have remained on Tour for many years, decades even, like Tiger Woods, Phil Mickelson, and Ernie Els. However, the PGA Tour is a very transitory competition. Around 225 golfers play more than 20 rounds in a season, but only 125 retain full playing privileges the following seasons; the rest attempt to qualify via Q-School or, failing that, play with reduced status or on the minor league Web.com Tour. Playing on the PGA Tour is very lucrative – purses are on average ten times larger than Web.com Tour purses, meaning players earn approximately ten times more money on the PGA Tour. The Web.com Tour qualifies only the best 25 golfers to the PGA Tour every season, meaning not even 10% of the Web.com golfers receive promotion to the PGA Tour. Because of this financial disparity, only a third of golfers who competed regularly on the Web.com Tour in 2013 earned more than the US median household income for 2013 (~$51,000). Professional golf requires endless hours of practice, separation from family/friends, and constant travel between tournament venues that regularly cover at least three or four continents. It may be that the average PGA Tour golfer just cannot handle the constant grind of professional golf and his skills slowly deteriorate from very early in his career. Because it’s unlikely that the average PGA Tour pro will even maintain their membership from year, most professional golfers face years of yo-yoing up and down between the lucrative PGA Tour and the relative penury of the Web.com Tour. Viewed like that, it’s understandable why the typical player does not improve. Understand that there are many forces at work to produce the small improvements or declines due to age. Golfers certainly become more experienced at reading greens, making club decisions, and choosing how to play shots as they play deeper into their careers. At the same time, the athletic decline observed in other sports affects a golfer’s ability to generate club head speed or repeat their swing. Many commentators talk about how older players get the “yips” and putt worse than they did when younger. At the same time, golf requires constant dedication to practice and preparation. A golfer that isn’t prepared to commit hours to practice each day is going to watch his skills erode. It is likely that the aging curve observed above is a combination of all these factors. Again, I have to stress how I looked at typical PGA Tour professionals. There are likely many different aging curves based on ability. I would be stunned if the aging curve for elite golfers resembled this slow decline. Golfers who are elite can expect significant and sustained rewards for high levels of performance. Elite golfers are unlikely to lose their playing privileges on the PGA Tour, so they know that by maintaining their practice and preparation they can expect to earn more than a million dollars in prize money per season plus endorsements and appearance fees. That is what fuels golfers like Mickelson and Vijay Singh to take care of their bodies, to practice, to prepare for each tournament, and to withstand the weekly grind of playing in different tournaments. I’d like to follow this study up with one that does weight the data by rounds played. I’m also less comfortable with my regression technique than I would like. Instead of regressing every observed value by a fixed ~30% to the mean, I’ll regress the observed by adding a certain number of rounds of average play. For example, past work I’ve done estimates that adding 25.5 rounds of 0.00 properly regresses the observed data. – I defined PGA Tour rounds as any PGA Tour (co-)sponsored tournament plus the World Golf Championships and Majors. Doesn’t make any damn sense. As someone who both enjoys golf and is also a professional athlete in a far more physically taxing sport, I can state for a fact that with proper training and nutrition, there is nothing about golf that should cause the body to break down in the early-mid 30’s, barring an injury that’s continually aggravated. Guys should be able to hit the long ball well into their late 40’s or beyond. They hit 18 drives a game, for god’s sake. That’s around 920 drives for the entire tour, or roughly the equivalent to the punishment an MLB pitcher puts on their body in maybe 20-25 games, assuming around 40 pitches… And they pitch 162 games a season. Nolan Ryan pitched effectively until he was 46. Since I doubt all the PGA players that made up the above graph suffered from chronic injuries, there has to be another factor beyond aging bodies… Mental stress? You say 920 drives for the entire tour… but you don’t take practice into account for any of this. I am a college golfer myself so I understand what they go through, although on a slightly less rigorous basis. Pro’s have nothing but all day to practice, and that takes a toll on the body. You see 4 rounds on TV, but you don’t see the 5,000 swings they took the week before that preparing. Not to mention the 25+ years they’ve been playing golf. I agree mental toughness is a factor, specifically with putting as it’s statistically documented that putting efficiency decreases with age, but it’s very realistic for people above 35 on tour to start to ware. Baseball pitchers get perfect conditions for every pitch, golfers have weird lies that can strain their body. Pitchers get relief from their clubs so they do not pitch every game, golf is a one man sport (professional golf) and success is solely based on your performance. Golfer’s are the only professional athletes that don’t have guaranteed money for performing their craft, which I believe drives the competitiveness of the sport so much and thus causing golfers to overexert themselves in their prime years. I’m confused why you structured your argument the way you did, because you’re obviously aware of the hours pitchers put in themselves to compete on the level that you did.